A few days ago I reported that there looked to be a promising weather window on Manaslu which we were about to take advantage of and push for the summit. 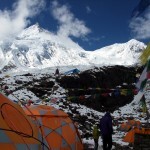 Yesterday morning I awoke in Camp 1 at 5770m to the sound of silence: no pitter-patter of snow on the roof of our tent. I soon found out the reason when I pushed on the ceiling to dislodge any snow that may have fallen overnight. There was so much snow on there that it was muffling the sound of snowfall. With the snow dislodged the pitter-patter resumed. Outside it looked like a wasteland. Dorje and Gombu were already digging our tents out, but the 50 or so other tents at Camp 1 were buried in nearly 2 feet of fresh snow. One collapsed from the weight of it before our very eyes. I could barely see the seracs guarding the route to Camp 2 in the white out, and we could hear many avalanches roaring on the slopes above. We had no option but to descend to base camp to await better weather. So what went wrong? Why had our forecasts predicted a promising weather window when there clearly wasn’t? In fact so many factors are at play that it’s amazing our mountain weather forecasts are as accurate as they are. 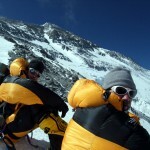 Most of the forecasts being used on Manaslu are based on weather systems using satellite data. 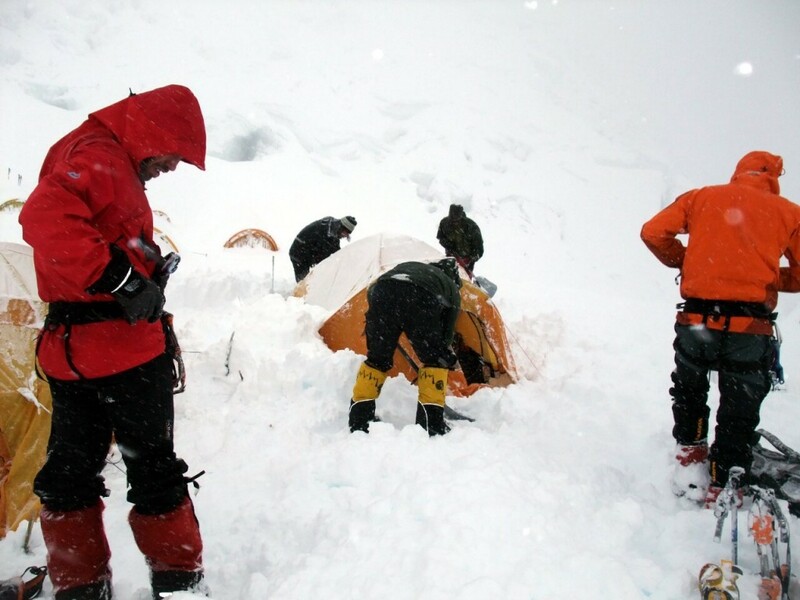 Then there are local factors that are not being monitored on the ground here, except by climbers relaying them verbally back to their forecasters. And even then all sorts of different things seem to be happening at different altitudes. 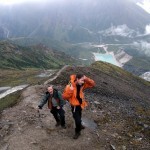 For example, for many days we experienced constant rain at base camp, while higher up above the clouds it was clear. We in the Altitude Junkies expedition team are using a bespoke forecast from West Coast Weather using North American data, while the Himex team, the biggest team on Manaslu this year, are using European models provided by Meteotest in Switzerland. Most of the other teams are either following our lead or using some of the free forecasts available on the internet. Mark Dickson and I used a surprisingly accurate one called Mountain Forecast on Baruntse last year, which Mark’s girlfriend Claire sent to us via satellite phone each day. Both our and Himex’s forecasts showed a promising weather window a few days ago. Ours also showed the small possibility of a storm arriving from the Bay of Bengal on 24th, though it looked like it would pass well south of Manaslu. Camp 2 would not be a good place to be caught in a storm, since descent to Camp 1 through the maze of seracs would be tricky with both trail and fixed ropes buried under fresh snow. Positioned at Camp 1 we could take advantage of the weather window, yet still be in a good position to retreat should the storm hit us, as it did. 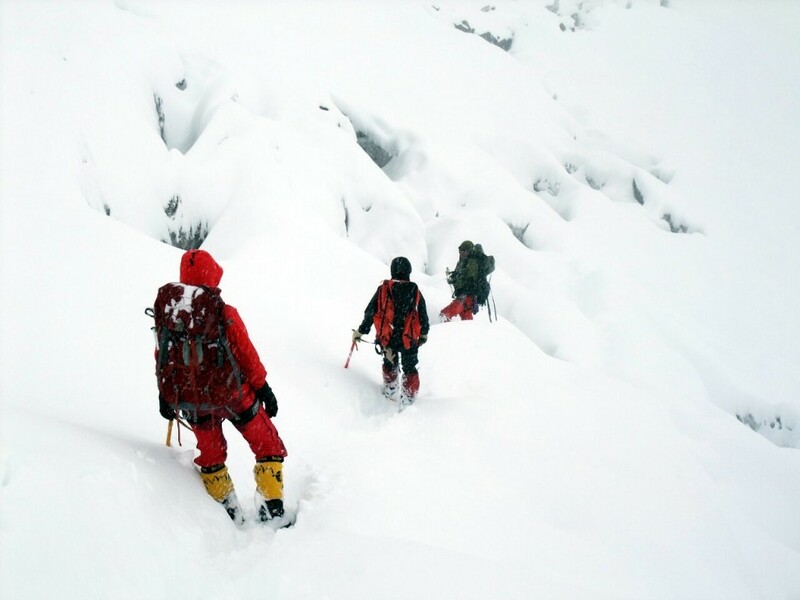 I learned a bit more about glacier travel during our descent to base camp in a blizzard. Gombu led the way and somehow managed to find the buried trail. I made the mistake of following behind our two women climbers Anne-Mari and Mila, whose lighter frames glided over any freshly hidden crevasses, leaving the lumbering oaf behind them to fall in. This happened twice. On both occasions I was clipped into the fixed rope, and in any case the piles of fresh snow cushioned my fall before I needed its security. I fell to my waist both times and was able to climb out on my own. I would have been better off following that stocky lump Mark Dickson, who behind me kept complaining that I climbed out before he had his camera ready. At the end of the glacier we usually remove our crampons to descend the last 300m of rock to base camp (at Crampon Point, or Crampton Point as we’ve dubbed it in honour of our curiously coiffured expedition leader Phil Crampton), but with so much snow the rock scramble had become an easy snow slope, so we kept them on. 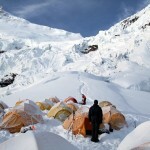 Everyone is safely off the mountain now and back at base camp. As long as the snow consolidates and there’s another weather window we may even be better off, since we’re now better acclimatised from the extra night at Camp 1. The show goes on.